Each week, we ask five of our sportswriters five questions about Ohio athletics. Their answers may surprise you. This week, we talked to sports editor Alex Hider, contributor Danny Medlock, , football writer Zak Kolesar and soccer writers Bez Saciri and Corbin Bagford. 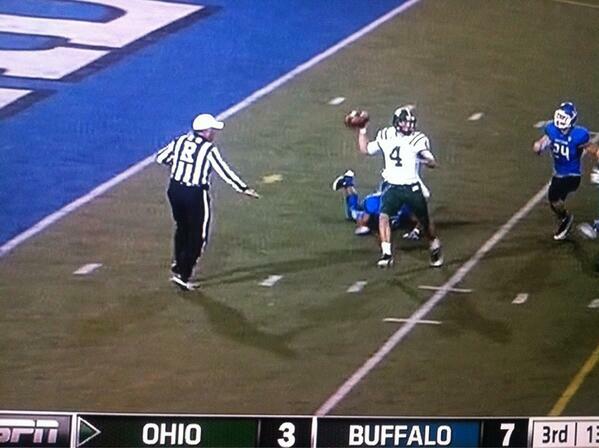 Officials ruled Tyler Tettleton was in the end zone when this pass was thrown, resulting in a safety for Buffalo. What was your reaction the the “Phantom Safety” call in Tuesday night’s football game? Alex Hider: I still can’t believe that call was made. Is that Jim Joyce making that call? The referee couldn’t have been in a better spot. I mean, he’s inches away from Tettleton when he throws the ball away at the four yard line. Couple that with the blown fumble review, and you can bet that this crew won’t have any more nationally televised games for a long time. Danny Medlock: First I giggled like a little school girl, then they said they couldn’t review it – then it was hilarious. It has to be one of the most embarrassing moments for the MAC in a very long time. Zak Kolesar: Covering the game, I had TweetDeck on hand, so I watched as my feed exploded with ref-bombs and I was actually pretty calm because I never though in my mind that there would be a discussion over a safety. When I saw Tettleton sitting on the ground in the end zone staring up at the umpire confused, I knew something was out of whack. But more importantly, this means there needs to be a doing away with ridiculous rules that prevent obvious bad calls from being overturned. Bez Saciri: It’s obvious the referee made a poor decision, but the way Ohio responded after the terrible call was what is most alarming. The Bobcats were unable to stop the run, they could not muster much on offense and likely first-round draft pick Khalil Mack made his presence felt. Corbin Bagford: I’m still in shock that it happened. The referee was standing three feet away from Tettleton when he threw the ball (clearly at the 4 yard line) and yet still somehow screwed it up. I thought it was odd that the initial reaction from Tettleton was so calm. If that would have been called on me, I would’ve lost it… as I did when I saw it on TV. If you could only watch one game on Tuesday, what would it be? Football at Bowling Green, or basketball at Ohio State? Hider: If I were asked this a week earlier, this would be a much harder decision. With football’s dream of a MAC Championship crushed again, it’s a no-brainer. A win over Ohio State would be the program’s biggest regular-season victory since Tommy Freeman beat Miami on a last-second shot in 2010. Medlock: I’m spoiled, I can’t get excited about fighting for a Little Caeser’s Bowl berth. Let’s see how all these new faces mesh together against handsome Aaron Craft. Kolesar: Even after going to the preseason game on Saturday, I don’t have too high of hopes for the Ohio basketball team. I don’t know how they’re going to win without a true star on the team (yet). Ohio State is going to have their way with the basketball team. I don’t have high hopes for the football team either (I recently picked them to lose by 20 ), but this game at least has a chance of being competitive. Saciri: With Ohio football’s MAC Championship dreams all but over, the basketball game is the one I prefer to watch. This is the first time since the 1994-1995 season that these two teams have faced off, and Ohio fans will quickly see how this team stacks up to a team who has national title aspirations. Bagford: My head tells me to watch the football game at Bowling Green, but there’s something tempting about seeing if we can hang with so-called “big brother”. The basketball team’s performance on Saturday will determine which one I’ll tune into the most. The swimming and diving team has started the season with two victories. What’s the coolest diving board trick you’ve ever done? Hider: I don’t like to brag, but I did do a flip off the diving board, and I totally nailed it. What’s that? That permanent red mark on my stomach? Don’t worry about it. K0lesar: I’m more of a finesse guy when I’m in the water, so I go for the simple, clean, pencil dives. Saciri: I’m not too ambitious, but doing a backflip into the water is something I have done on one occasion. I love when I can watch other people do cool tricks because the sight of the water coming up into the air is nice to see. Will we see improvement from the women’s basketball team this season? Hider: As hard as it can be to go undefeated in MAC conference play, it can be just as hard to go winless. The Bobcats nearly pulled it off last year, finishing 1-15 in MAC play. There’s no where to go but up for this team. Kolesar: I truly think so because of the coaching change that was made. A lot of players lashed out on former head coach Semeka Randall, and with Bob Boldon coming into Ohio with a good reputation, you will see a lot more out of the players this season. Saciri: After last season, the only way this team can go is up. I think the players will play hard for Coach Boldon. Mariah Byard will need to show leadership and change the game with her scoring and assists, while Kiyanna Black looks to continue last season’s fine form. Bagford: So far in the 2013 calendar year, the Bobcats are 2-16. It’s hard to not improve on a record like that. Hopefully the addition of six freshman will add a spark to Ohio’s play and generate some wins. Nothing says more about a person than their order at Chipotle. What is your typical order at Chipotle? Hider: I’m going to let you in on a few of my Chipotle secrets. 1. Always get a bowl. Tortillas only limit your amount of Mexican goodness. 2. Always go for “half-and-half meat.” You always end up with more than had you just chosen one meat. Plus, why limit yourself? 3. Don’t forget the vinaigrette. Ask for it when you start your order. It will change your whole outlook on Chipotle. Medlock: Steak bowl, no beans, extra tomato, extra hot, cheese. I’m hungry, I’m going to stop writing now. Kolesar: I’m cheap, so I go with chicken. But I always ask for my burrito to be swimming. Can never have too much sour cream. Saciri: As crazy as it might sound, I have never eaten at Chipotle. If I’m going to eat uptown, I’ll usually go with GoodFella’s or Wendy’s. Bagford: Burrito Bowl: extra brown rice, chicken, extra medium salsa, cheese, lettuce. Simpler is better.